^ Festing, Sally (1995). Barbara Hepworth: A Life of Forms. pp. 10–25. 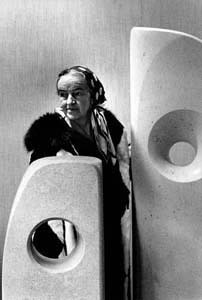 ^ a b c Gale, Matthew "Artist Biography: Barbara Hepworth 1903-75" Retrieved 31 January 2014. ^ "Abstraction-Création". Encyclopaedia Britannica. Retrieved 31 January 2014. ^ Bowness, Alan ([n.d.]). Life and Work. Hepworth Estate. Retrieved 31 January 2014. ^ Riggs, Terry "Artist Biography: Ben Nicholson OM 1894-1982" Tate, Retrieved 29 January 2014. ^ a b c "Barbara Hepworth: The Hospital Drawings" Pallant House Gallery, Retrieved 31 January 2014. ^ Behrman, Pryle. "Fifty Years at the heart of British Printmaking" Archived 2014年2月19日, at the Wayback Machine. Retrieved 31 January 2014. ^ a b "Barbara Hepworth: Graphic Works" Hepworth Wakefield, Retrieved 31 January 2014. ^ Bowness, Alan. "Biography" Retrieved 9 March 2014.